I’ve been seeing some articles lately about the robust American economy and the historically low unemployment rate. CNBC has even reported a “suddenly hot job market,” for workers over 50. Given that I had never heard anything so absurd in my life, I couldn’t help but take some time to determine if a miracle had indeed occurred in the U.S. while I was in Mexico. Was it true that the country is experiencing an employment trend that has never happened in the entire history of mankind - An unprecedented preference for older workers as the headlines suggest? My website promotes the idea of Mexico as an alternative for those who want to retire and cannot afford to do so in the U.S. - especially with the current crisis in American healthcare costs (Ours is most expensive healthcare system in the world). My own move to Mexico in 2014 was ignited by the poor job outlook for people over 50. You may think that good employment news for older people runs counter to what I promote. It doesn’t. The idea of moving to Mexico is also based on a great philosophical truth unrelated to the job market. More on that later. Maybe you are trying to decide whether you should fish from the American economy or cut bait and live in a less expensive country. Perhaps you are wondering how much of the news regarding an improved job outlook is hype (by those whose job it is to make Baby Boomers feel like anything is still possible), and how much is a fortuitous dove-tailing of a tight job market with a lot of available older workers. Many of us will retire later than our parents did. Those over 50 were the hardest hit by the Great Recession. We lost jobs in our peak earning years, and many saw a big reduction in income when and if they did find new work. Retirement savings were decimated, forcing many to continue working at a time they had planned to retire. According to the U.S. Bureau of Labor Statistics, labor force participation is expected to increase the fastest for people 65 to 74, through 2014 although they make up the smallest number of workers overall. Over half work for financial reasons. The good news is that older are finding work again after those first bleak post-Recession years. The unemployment rate for people 55 and older is now just 3.1%, less than the overall jobless rate of 3.9%. The time it takes for an older unemployed person to get a new job has decreased from 50 to 34 weeks. Healthcare jobs are expected to lead employment growth. What other kinds of work are these employers breaking down doors to fill? When you consider published lists of jobs that most favorable to older workers, sources often lump together those that take a high amount of training and experience, like a dental hygienist, library technicians, dress-makers and embalmers, with those that don’t, like amusement park attendants and crossing guards. Let’s look at both. Older workers in these professions may be paid less than their younger peers because of what’s called monopsony, which basically exists when an employer is able to pay less because workers do not have the ability to relocate to better-paying markets. Nonetheless, they are getting jobs in their fields again, a trend to celebrate. When looking at jobs overall, studies indicate that most older workers are being funneled into what’s rather uncharitably termed as “old people’s jobs.” According to the New York Times and the Center for Retirement Research at Boston College, most older workers are finding work in lower-skilled service jobs. Older workers are 65 % more likely to find work in childcare, 93 % more likely to work as cab drivers and twice as likely to find work in retail, which already employs large numbers of older workers. (I can’t resist saying that older people might be America’s new Mexican worker). “Old people’s jobs” also include truck driver, secretary, janitor, nursing aide, cashier, and book-keepers (I would argue that all of these probably still require some experience.) In one category, real estate sales, the prospect of being hired as an older person increased to whopping 162%. This is very misleading, as are many employment statistic factoids. Real estate sales are commission jobs, often a contract job without benefits, as are many sales jobs. Straight commission jobs will always be easy to get. Employment statistics are usually pretty meaningless. They paint the rosiest picture by eliminating details like straight commission pay, and our government finds it more convenient to discount large swaths of the population, like veterans or those who have given up looking. They count even those with a few hours work a week as employed making it hard to assess how many people are able to support themselves. Flawed as stats may be though, the picture is undeniably better than recent years. A 2018 report by the Equal Employment Opportunity Commission (EEOC) tells us that age discrimination remains very much with us as the “most acceptable” type of job discrimination. In conclusion, if you think no one wants to hire you because of your age, you are likely wrong. If you have a skilled profession and still enjoy it, your prospects have improved from years past, even if your pay might be less than your younger peers. If your only choices for jobs are ones you will hate, that’s when you have to decide whether to believe Senaca or CNBC. A good loaf of bread in Mexico? fo-getta-ba-dit. The perfect activity for when you want to be alone and with a lot of people at the same time. Kerry Baker is the author of two books. The first, the Interactive Guide to Learning Spanish Free Online is a curation of all the best free Spanish teaching websites organized into lesson plans with interactive links. The book is supported by a book page on this site. 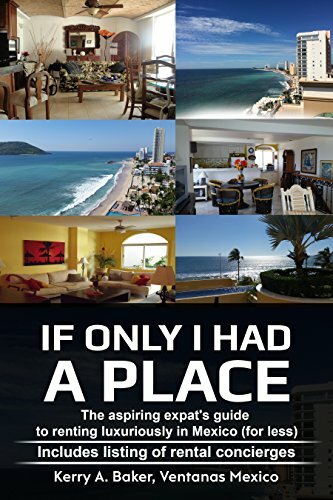 The second book is "If Only I Had a Place" which is your guide for renting long term in Mexico and includes a list of rental concierges in the most popular expat distinations. Renting in Mexico is different. This book tells you what realtors don't want you to know.